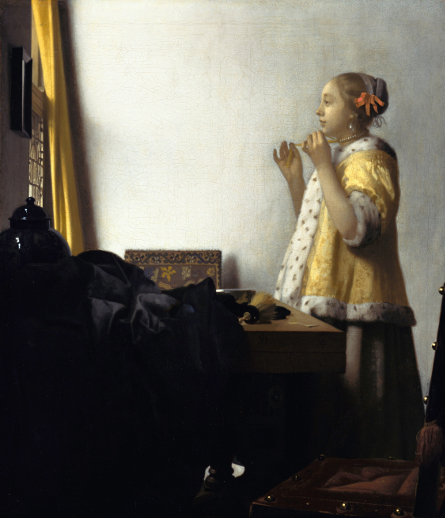 Vermeer used various painterly tricks to make these moments — these mundane tasks — look special. He expended a great deal of time and energy capturing the effects of light. He studied the way light comes in through a window, bathing a room. 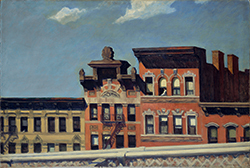 He seems to have painted most of his pictures in one or two rooms in his own home. He knew that light well. He analyzed that light, meditated on it. Using that light, he projected images through a camera obscura and probably through other kinds of lenses and mirrors available in 17th-century Holland. This allowed Vermeer to concentrate on every sparkle, shine and glimmer. He concocted different methods for reproducing those glimmers and shines. Sometimes he would render an object, like a knob or finial, simply as an effect of light. That’s to say, we only know the object is there because of how Vermeer painted the light shining upon it. Art historians love to wax poetic about “brushstrokes” and a particular attitude to canvas and pigment they like to call “painterly.” But the funny thing about Vermeer is that many of his paintings were probably made by the careful application of small splotches of paint, in an almost paint-by-numbers attempt to reproduce, inch by inch, the image of a camera obscura. The current film Tim’s Vermeer documents the process by which tech engineer and non-painter Tim Jenison paints a Vermeer using simple tricks of mirrors and a camera obscura. The result is not a Vermeer painting. But it is close enough to show that much can be accomplished with a camera obscura and a small mirror. The film proves that some of what Vermeer achieved in the area of “miraculous” realism and the capturing of minute effects of light was a more or less mechanical affair. Vermeer, the mechanist of the camera obscura, would take liberties with the photograph-like image he was producing. He would adjust perspective and blur lines. He liked to paint wet on wet — meaning that he would let the colors, especially along edges, merge and blend with one another, just enough to give everything a slight haze. They aren’t many hard lines in Vermeer. Look at his paintings closely and they start to get muddy. Soft. That word comes to mind again and again with Vermeer. Yet there is a precise geometry. Vermeer thought about his vanishing points, the places in paintings where lines of perspective converge and guide the eye. Often, the vanishing point leads us right to an object: the jug of milk; the pitcher of water; the hand of the woman holding a balance; a book; a string of pearls. There are tiny pinpricks in many of Vermeer’s paintings. He would stick a pin in the painting, attach a string to the pin, put some chalk on the string, and then make a number of erasable perspective lines on the painting with which to work out the lines of perspective. Some of these lines he would later ignore, or adjust in ways that do not, strictly, make sense. Vermeer wanted to create perspectively correct scenes that also conformed to his own inner sense of how a room should look and feel — where he wanted the shadows to be and how he wanted reflections to appear. These are some of the techniques Vermeer used to make his pictures look the way they look. He studied the other Dutch painters of his time, too. He looked at Jan Steen and de Hooch and, probably more than anyone, Carel Fabritius, a student of Rembrandt. 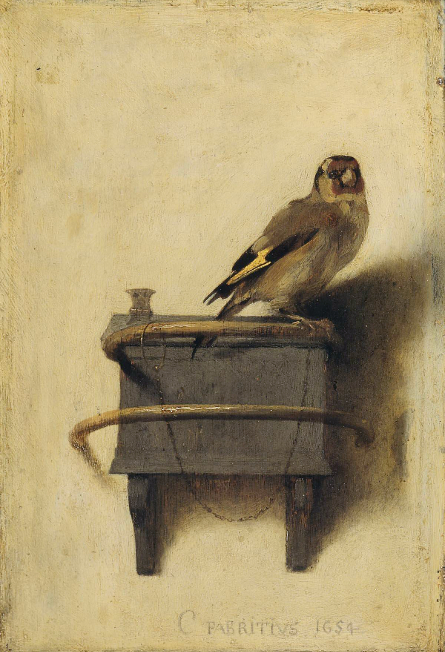 There’s a painting by Fabritius, “The Goldfinch,” that’s got that Vermeer feeling. The gentle but illuminating light on the off-white wall. The cool colors. The soft lines in the feathers and colors of the goldfinch. Vermeer learned much from Fabritius about tone. 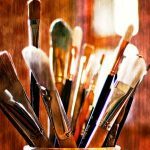 When you are a painter, you don’t just think about what color to use (hue), you think about how dark or light the color needs to be (tone), especially in respect to the other hues and tones of the painting. Fabritius and Vermeer liked to keep the tone down. This, too, came from much study and replication of images from the camera obscura. It is clear that, more than other painters of the time, Fabritius and Vermeer were addicted to the cool tones of the camera obscura. It felt right to them. The cool-toned image was something they wanted to capture in paint, to manipulate, to preserve forever on canvas. Vermeer’s techniques give his paintings their unique feel. But all we have to do is look at the paintings of Canaletto (1697-1768) to know that an interest in the image produced by a camera obscura does not necessarily result in paintings like Vermeer. 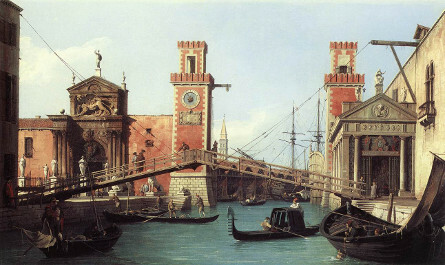 Canaletto’s Venetian landscapes have some of the same cool tones and blobby light-effects you see in a Vermeer, but the subject matter is completely different. The feel of the paintings is different. You can’t help but think that Vermeer and Canaletto are painting completely different worlds, even as they inhabit the same planet. The analysis of technique and technology, however refined, never gets us to the heart of the pictures. It never explains the mystery of Vermeer’s paintings. Vermeer’s paintings were appreciated in his time. But they were not loved by many. Vermeer died a poor man. He painted few pictures, around 40. Many of them he kept around the house until he died. It is not unreasonable to assume from this that Vermeer was painting for reasons of his own. He was trying to reveal something through his pictures. The tricks of optics and the painterly skill were at the service of this revelation. It is something that we want to see, too, something that we’ve become more obsessed with as the years pass. But what is it, exactly, that we see? There is a small Vermeer painting currently on display at the Philadelphia Museum of Art. 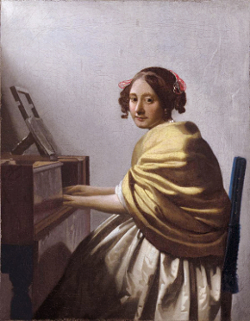 It is the picture of a young girl sitting at a virginal (a virginal is basically a small piano). Light comes through a window at the top left of the painting, as is typical in so many Vermeers. The girl has been interrupted in her playing and looks out toward us, the viewers. She doesn’t quite meet our gaze — or does she? Sometimes, it seems that she looks slightly past us, and to our right. Something has attracted her attention, or distracted her completely. This little painting was not always accepted as a Vermeer. Only recently have most of the experts and scholars come on board. It is also unusual that the painting is in private hands. All the other Vermeers are owned by museums. The sparseness of the painting, and its small size, make the painting particularly hard, even for a Vermeer, to interpret. The painting has two obvious elements: looking and music. It is about paying attention to, and being distracted from, music. 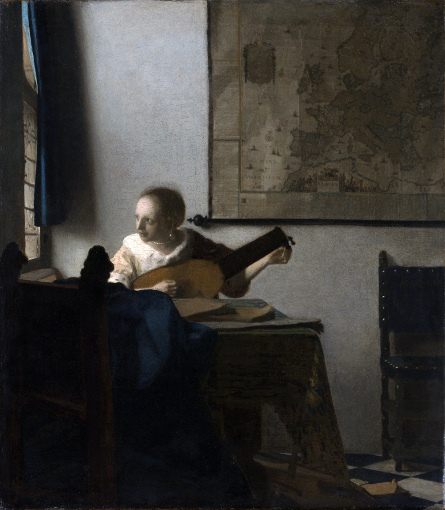 Vermeer painted musical scenes many times. He also painted a number of pictures where women are distracted from whatever they are doing and look out toward us. Vermeer was always interested in women paying close attention to some task: writing a letter, sewing, playing an instrument, or putting on jewelry. He was also interested in what happens when that concentration is broken. Vermeer, then, was fascinated with thresholds. To put it another way, he was interested in what happens when a person is concentrating on one thing and is then brought back to a moment of self-awareness. Vermeer does not show us how or why the young woman at the virginal has turned away from her instrument. She could be glancing away from the virginal because she is trying to remember a phrase of music. Haven’t you ever done that? You look away from something you are concentrating on in order, paradoxically, to increase your concentration. That’s exactly what might be happening in Vermeer’s “Woman with a Lute,” where the woman glances out of the window as she tunes her lute. She is looking away in order to be able to hear the notes better. A lute was a notoriously difficult instrument to keep in tune. The human instrument is notoriously difficult to keep attuned as well. We are constantly drifting in and out of attention. When we are fully absorbed in one thing, the rest of the world fades away. Music brings this out especially. Playing music can often be a process of “going in” to the music and then “coming back out” again. But every activity is like that to a greater or lesser degree: having a conversation; daydreaming; writing a letter; performing daily tasks and chores. And these are exactly the types of activity that Vermeer painted. In all of these paintings, human beings, women mostly, are shown in various states of attention, of self-awareness and of the immediate moments just before or just after becoming self-aware. Let us call all of these moments “threshold moments.” Are threshold moments beautiful? Yes. Why? I don’t really know. But it might have something to do with the following. We (human beings, that is) are a hovering kind of creature. We are never entirely outside of ourselves, nor entirely inside either. We experience moments of intense concentration, and moments where concentration is broken. We sometimes perform tasks with little awareness of what we are doing, and we are sometimes, especially at threshold moments, hyper-aware of ourselves and what we are doing. Subjectivity, to put it simply, is inherently strange. The core of the ego, the “I”, is a thing that hovers around itself, never fully apparent to itself, but never fully opaque either. We catch ourselves being conscious all the time. But what is the thing that is catching the other thing being conscious? It is impossible to pin down. And yet, daily life is infused with this process. It happens over and over again throughout our waking hours. We direct our attention to something we are doing, we begin to lose ourselves in the activity and then something happens, in ourselves or in the outside world, and the self-awareness jumps back in again. Vermeer painted these moments in their variety. 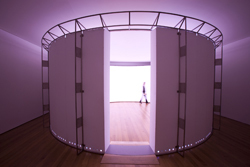 Why did he paint threshold moments with such attention to the toned-down beauty and soft glory of the image of the camera obscura? Because he was convinced that threshold moments are sacred. And he had discovered painting techniques to create a new kind of sacred painting. Vermeer had reason to be interested in painting and the sacred. For many years, Vermeer had studied the ways of one woman in particular. This was Vermeer’s wife. He fell in love with her as a young man. He converted to Catholicism for her. Catholicism was officially illegal in the Dutch Republic of Vermeer’s time. So, Vermeer spent his adult life living in a kind of Catholic ghetto of Delft where the people of the neighborhood had to worship more or less in secret. They had a secret church and secret meetings. They were not, it should be said, in any great danger. The authorities mostly looked the other way. But the experience of worship and prayer, for the Vermeers, was one heavily tinged by the idea of hiddenness. For the Vermeers, the sacred was always hidden in plain sight. The acts of simple, daily worship had to look one way for the external world of contemporary Dutch society, even while containing great significance for those engaged in them. Why are there, we might ask, two Vermeer pictures in which a man helps a woman to consume the contents of one glass of wine? These are not people enjoying the pleasures of wine together. These are people doing something important, though unnamed, with wine. Sacramental. Even in the Vermeer pictures that do not expressly take up religious themes or imagery, the quality of the sacramental is unmistakable once you know how to look for it. It is there in the gentle, attentive, worshipful manner in which the maid pours out the milk from the jug. It is there in the incredible presence of the woman who puts on a pearl necklace. As the writer Siri Hustvedt once noted of this painting, “Vermeer brought the miraculous into a room just like the rooms he knew, and he endowed the features of an ordinary woman with spiritual greatness. ‘Woman with a Pearl Necklace’ is a painting that makes no distinction between the physical and the spiritual world.” It is that lack of distinction between the physical and spiritual world that creates the sense of mystery. You know you are looking at something more than what you seem to be looking at. Threshold moments are, in Vermeers, hidden and obvious simultaneously. It is not Vermeer’s intention to pull away the veil, to reveal the hidden structure of these daily sacraments. It is his purpose to show them to us as hidden and as right there, eternally holy in their sacramental character.